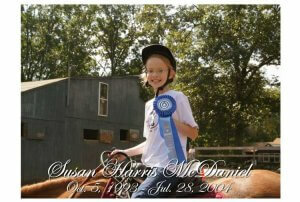 Susan McDaniel, an athlete, actress, and equestrian, was a student at Lovelane throughout her two-year battle with cancer. Susan passed away in 2004 at the age of 10. The Run for Lovelane, established in 1996, was dedicated in Susan’s memory in 2005. At the same time, the Susan McDaniel Tuition Assistance Fund was created. The intended purpose of this non-restricted fund is to support families who are unable to afford Lovelane’s lesson price of $136 weekly. Lovelane accepts children off the waitlist based on next availability, whether or not that family has the ability to pay. Once in the program, families may apply for tuition assistance. Forty percent of Lovelane families receive tuition assistance totaling $65,000 annually through the Susan McDaniel Tuition Assistance Fund. For more information about the Tuition Assistance Fund please contact Stephen Doyle at 781-259-1177 x27 or Stephen@lovelane.org.